MR Online | NUMSA New Year Statement: A clarion call to build a Revolutionary Workers Party! NUMSA New Year Statement: A clarion call to build a Revolutionary Workers Party! Comrades 2017 was a year where the global crisis of capitalism deepened. Just like the 2008 global financial crisis, capitalism demonstrated once more that it has failed humanity and has no solutions for problems that are confronting society. Therefore the future is socialism and the struggle in 2018 is to build a revolutionary mass vanguard party led by professional revolutionaries. The working class has no reason to celebrate the leadership changes in the ANC. The recent leadership changes that have resulted in the Deputy President of the country Cyril Ramaphosa ascending to the presidency of the ANC is not a reason to celebrate, particularly for the working class. NUMSA refused to endorse one faction of the ANC over another. We have always known that regardless of who emerged the winner, the governing party will continue to pursue backward, right wing, neo-liberal macro-economic policies which are hurtful to the working class and the poor. For the last two decades, the ANC government has waged an all-out assault on the African working class in order to defend White Monopoly Capital. The ANC has faithfully implemented the National Party’s neo-liberal capitalist economic policies, starting with the Growth Employment and Redistribution policy (GEAR) and now the National Development Plan (NDP), both of which are the DA’s economic policies in disguise, in order to please international rating agencies. These policies have resulted in massive job losses and long-term mass unemployment. They have created a society of extreme inequality. The majority suffer as they did under Apartheid, living crammed together with cockroaches and rats in townships and shacks, without sanitation, water and electricity. 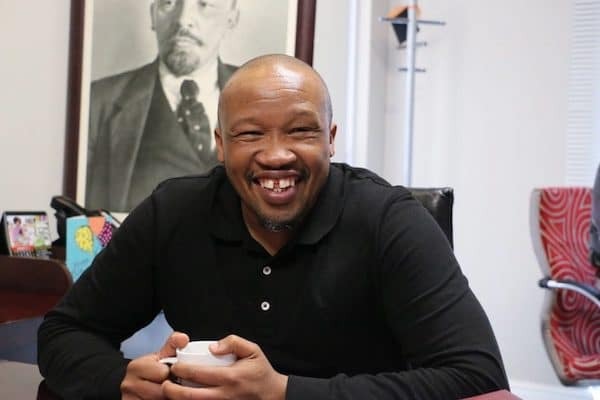 NUMSA shares SAFTU’s view that “Cyril Ramaphosa is a deeply compromised capitalist billionaire, with hands stained with the blood of the 34 victims of Marikana who were shot in cold blood by the state to shield White Monopoly capital in general and Lonmin in particular”. Furthermore, it is naïve to believe that the cronyism and corruption which is a hallmark of the ANC will disappear. The very same people who stood by quietly whilst the state was actively looted by various factions of capital including the Gupta and the Rupert families are the ones who make up the top leadership structures of the ANC, and this includes Ramaphosa himself. They cannot extricate themselves from the corrupt tendencies of the party. Furthermore the ANC has been enabled in its corruption by the leadership of the South African Communist Party (SACP) and trade union federation COSATU who actively continue to mislead members of the working class into supporting their worst butchers, for their own selfish narrow political agenda. It is for this reason that as the National Union of Metalworkers of South Africa (NUMSA) we are calling on all those who genuinely see themselves as Communist to swell the ranks of the Workers Party we are crystallizing. If you have no New Year’s resolution for 2018, we are sponsoring this one. Be part of the revolutionary forces working with NUMSA, the biggest trade union in South Africa, and one of the largest worker-controlled unions in Africa. We call on you to help us build a Workers’ Party which will fight in the interests of the working class and the poor. Its vision is subordinate to the working class and the poor of our country. The struggle for socialism is not an end in itself, it is a struggle for a communist classless society which Karl Marx correctly described as: “from each according to his ability, to each according to his needs”. 1. NUMSA demands a living wage which will allow the African majority to live a life of dignity. We reject the National Minimum Wage (NMW) of R20 per hour because it is not designed to abolish the Apartheid wage gap. NUMSA demands a living wage, not just a minimum wage. The miners of Marikana were murdered by the state for daring to demand a living wage of R12500 per month. The amount of R20 per hour which has been proposed by the state is an insult to their memory. Furthermore, R20 per hour does not even begin to bridge the wage gap between the African majority and the white minority which was caused by the dehumanizing system of Apartheid. StatsSA confirmed that white households which make up only 8 per cent of the population earn five times more than African households which make up more than 80 per cent of the population! Proving once more that the ANC has become nothing more than a defender of white wealth and privilege. 2. NUMSA will defend the right to strike. We reject the proposed changes to the Labour law which will tamper with our right to strike. This is nothing more than the ANC government’s way of attacking our constitutional right to strike. We also reject the proposal which gives the Minister of the Labour Department the power to approach the Labour Court in order to suspend a lengthy strike. This takes away the right of ordinary workers to decide whether to continue or to end a strike. Ramaphosa is personally implicated in the mass murder of the miners of Marikana and therefore it should come as no surprise that he has been driving the process at NEDLAC to roll back on the rights which the working class fought and died for during Apartheid. Sadly the leadership of trade union federations COSATU, FEDUSA and NACTU are also complicit in selling out the working class as they have endorsed these outrageous proposals which have been designed to undermine the power of ordinary workers. 3. NUMSA demands the nationalization of the commanding heights of the economy and all minerals. We reject the ANC’s governments neo-liberal macro-economic policies (GEAR) and the (NDP). We demand that all our minerals must be beneficiated to diversify and drive a job led industrial strategy. The economy must be designed to benefit the majority, not just the wealthy elite. 4. NUMSA demands that all State Owned Enterprises (SOE) boards must be removed and replaced by new board members with direct representation of labour, government, business, and civil society. All procurement processes must champion localization and job creation. 5. NUMSA will defend the rights of temporary and contract workers in court and in the streets. In 2017 NUMSA won a Labour Appeals Court decision which re-enforced the rights of temporary workers. NUMSA took a case involving Assign Services a Labour Brokering company to the Labour Appeals Court (LAC). The LAC confirmed that contract workers automatically become full-time employees of the main employer after the three month period has lapsed. The Confederation of Associations in the Private Employment Sector (CAPES), representing labour brokers, is appealing this decision at the Constitutional court. They want the freedom to exploit workers through this form of modern-day slavery. As NUMSA we will fight them every step of the way in order to ensure that the rights of temporary workers everywhere are protected. We also demand a ban on labour brokers as it is pointless to allow the practice to continue especially in light of the recent court decision. The announcement by President Jacob Zuma on free higher education and training for poor and working-class undergraduate students is a positive development. Students categorized as poor and working class, under the new definition, will have their education funded and supported by government grants, not loans. However, we wish to remind Zuma that genuine free education does not mean shifting state resources from other pressing social needs in order to offer grants to a portion of working class and poor students. The sustainability of free education will come from resources obtained by the state from a combination of massive nationalization as well as by imposing a hefty tax on the rich. It seems the state intends to cut social spending in order to fund this policy. We will reject any attempt to take resources away from the poor and the working class in order to fund free education. The resolution to expropriate land without compensation will have to be implemented with speed to fund free education. The ANC government will only be able to sustain this program if it implements the Freedom Charter in its entirety. The resolution to expropriate land without compensation which was adopted at the ANC’s national conference last month will have to be implemented with speed if the governing party is to succeed in providing free higher education. Unfortunately, the ANC has a long history of failing to implement the resolutions adopted at its conferences. We remain highly skeptical until we see decisive action on the part of the governing party in this regard. History teaches the working class one fundamental lesson: they shall always be victims of the elite class unless they learn to see the class interests behind all phrases, proclamations, and political processes. The struggle for freedom and equality for all South Africans is far from over. 2018 will be the year to remind the right wing ANC government that true power resides with the working class majority. It was the working class which destroyed the Apartheid government, and only the working class can free itself from the Capitalist chains of economic oppression. The Dawn, International Newsletter of Popular Struggles, is edited by Resumen Latinoamericano and Secretariat of the Continental Coalition of ALBA's Social Movement.